Peter Hafez, our Chief Data Scientist, highlights the key results and comments on the methodology used by Citi quant research team in their report titled "Searching for Alpha: Profiting from Capex - Look To Capex Announcements". Recently, Citigroup’s Equity Research team published an interesting report on how investors can profit from CAPEX announcements. As a source for announcement data, they considered RavenPack’s event data that is automatically extracted from textual news and blogs using Natural Language Processing (NLP). Empirical evidence suggests high reported CAPEX firms experience poor future stock returns. Explanations range from management empire building (over investment) to investors over-reacting, to past growth. In their report, Citi proposes an alternative explanation. They argue that such strategies have more in common with Value than with Growth Investment. Furthermore, they suggest that reported CAPEX results in poor future performance because it is a lagging variable. CAPEX often takes years to complete with fundamental investors being well aware of possible management reinvestment before the information finds its way into financial statements. 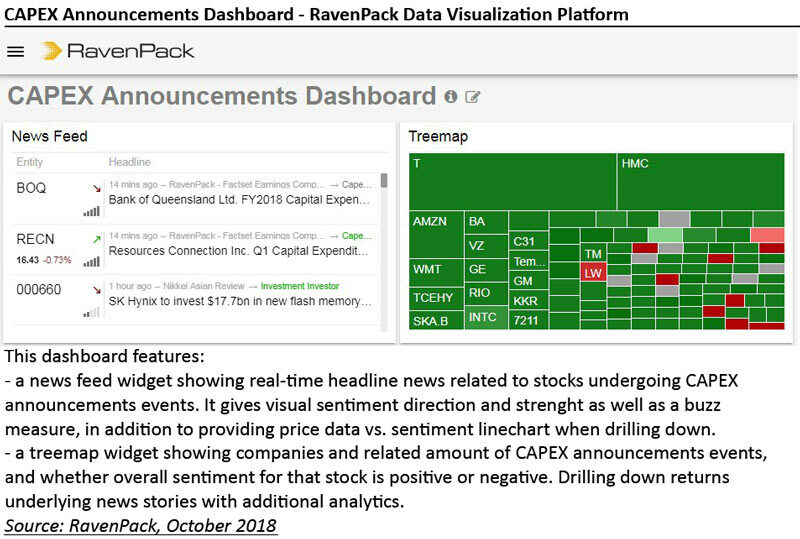 Using RavenPack data, the Citi Research team formulate investment strategies around CAPEX announcements, rather than reported CAPEX. Announcement data provides a significant timing advantage to reported numbers allowing investors to profit from corporate reinvestment, as well as the subsequent price reversal. This CAPEX Annoucements dataset allows you to query the data used in the paper.